I saw this kid driving through the heavy, rush hour traffic of Delhi. 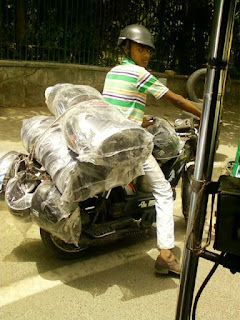 Somewhere he will be delivering motorcycle helmets. His own helmet is a very sad affair? Really? The men who employed him for this job couldn't make sure that his own safe skull was the best advertisement for their sales? Sad thing is, a delivery kid is probably worth less to them than the cargo he's delivering.